Oswald Tied to Clay Shaw at New Orleans Trade Mart? It's almost too trivial to mention, but that doesn't keep conspiracy authors, and most especially Robert Groden, from claiming it's important. 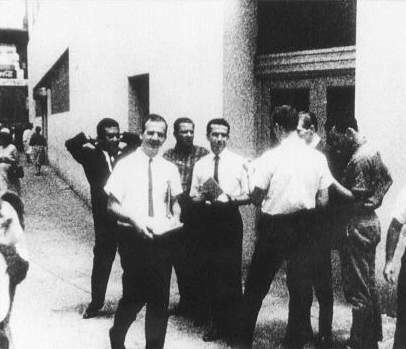 The fellow at right is, of course, our good buddy Lee Harvey Oswald distributing Fair Play for Cuba literature at the International Trade Mart on August 16, 1963. 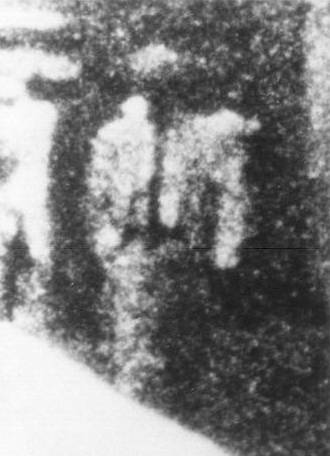 The photos on this page are still frames from movie footage shot by Johann Rush, a cameraman for WSDU-TV, a New Orleans station. Groden repeats this claim in The Search for Lee Harvey Oswald, pp. 74-75. The most obvious question is why this would be significant. Trying to tie Oswald to Shaw on the basis of a political demonstration in front of the Trade Mart (where Shaw worked) would be like trying to "tie" someone to the President of the United States because he demonstrated in front of the White House. But Groden is not telling the truth. Clay Shaw is not in the background of these photos. I know for sure because I took the photos myself, and I knew Clay Shaw in 1963. 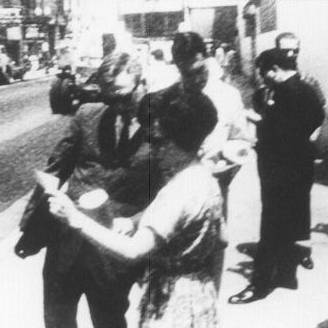 The pictures are actually still-frame blow-ups from a newsfilm I shot for WDSU-TV in New Orleans on August 16, 1963, as Lee Oswald gave out pro-Castro leaflets at the Trade Mart on Camp Street. 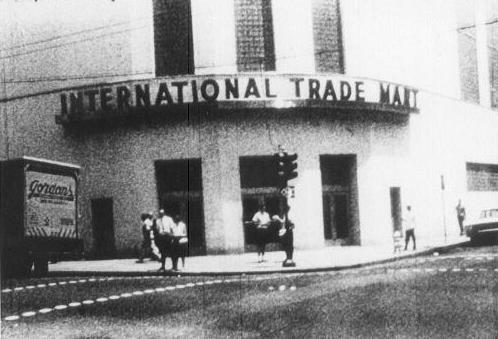 Shaw was the director of the Trade Mart at the time, and I was looking for Shaw that day. I wanted to film his reaction to Oswald's leafleting. Clay Shaw was never on the street in front of the Trade Mart during the leafleting, and I never knew if he was even at work that day. In 1968 Jim Garrison, whom I had known from my work at WDSU, called me at my new home in San Francisco and asked if I would sell him a copy of the film. I told Garrison that I would give him a copy, which I did, and I offered my services to him at no charge if he thought I could provide any new information for his investigation. I thought Garrison might be on the right track, and I was willing to help him. But that single phone call was the only one I received from him. He never asked me any details about the events I saw at the Trade Mart that day. Rush goes on to show a very large blow-up of the frame with the man in the white suit. In reality, the man is too thin to be Clay Shaw. So it appears we have yet another case of a photographic "expert" seeing something in a photo that's not there. Even more disturbing, a simple interview with Rush would have debunked this factoid. But Groden never bothered. Groden's O.J. Simpson trial fiasco.